Transforming engineered drawings into finished component parts and assemblies. that range from simple cutting, punching and drilling to complex fitting and welding. Following are some common methods we use in-house to prepare materials. Preparing plate and pipe as required. Multiple machining centers with work envelopes up to 60” x 24” x 18” (X, Y & Z). Industrial capacity burning table – 10’ wide x 30’ long. Plate burning up to 6” thick with weights up to 20,000 pounds. High-capacity plasma table – 10’wide x 30’ long. Plate plasma cutting up to 1.25” thick with weights up to 20,000 pounds. Turning machines with a max swing of 22”. Experienced fitters cope materials for exacting fit-up; CNC coping also available. CNC metal drilling machines for multiple applications that ensure a precision, properly sized hole. Hydraulic press brakes with max capacity of 600 tons to bend and form materials up to 14’ long. Automated and manual notching of ferrous and nonferrous metals. Punch presses applying as much as 600 tons to meet demanding needs. Band saw cutting capacity up to 30” throat and precision, high-speed cut-off saw tolerances of +/-.005”. Metals and composites up to ¼” thick and 12’ long. 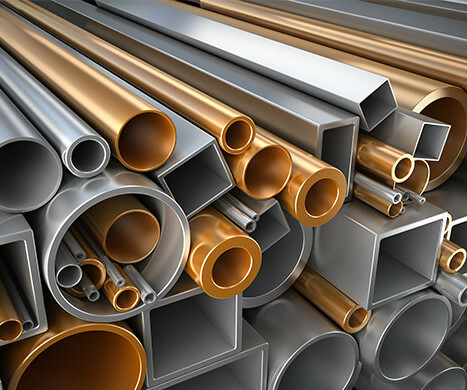 Precision is experienced working with a wide variety of materials, in all shapes and sizes. We convert these raw materials into specialized fabrications and assembled components and systems for the Aluminum, Oil & Gas, Telecom, Power Generation, Utilities, Chemical, Water Processing, Mining, Steel, Construction, Compressed Gas and Transportation industries. Our capabilities are virtually limitless. We don’t waste time learning the “tricks of the trade”. Instead, we learn the trade. Fabricated components are precisely fitted and verified to be dimensionally correct before finish welding. Value-add assembly services include certified, experienced welders applying finish welds to complete metal fabrications. Beam and pipe connections are made using specified fasteners and techniques to ensure compliance to specifications. 400 KW Ajax Magnathermic Induction Furnace with a 2,000 Lb. capacity. 100% visual inspection of all dimensions and every inch of all welds utilize trained inspectors. Certified Welding Inspectors on staff. Dry particle technique used to expose surface and sub-surface discontinuities in ferrous metal weldments. A low-viscosity penetrant and a highly sensitive developer reveal surface discontinuities in all metals. Electromagnetic waves used to create a photographic image of the internal composition of a material or weld for possible discontinuities. Ultrasonic waves used to examine the internal structure of a material or weld for possible discontinuities, such as voids or cracks. electricity, resist chemicals, or resist tarnish. See a sampling of common finishes to the right. We offer various levels of surface preparation, from as simple as hand removal of rust, dirt and grease to power brushing and media blasting. Hot-dipped galvanizing in conformance with ASTM A123 provides a long lasting corrosion-protection advantage. Ready, willing and able to prepare and paint our products to meet local code, SSPC requirements or your aesthetic needs. Capabilities include a 12” x 12” pass-thru shot or media blaster, as well as a manual blasting for larger items. A certificate does not make you certified. Everything that goes out of our doors is done with quality assurance and manufactured exactly to customer specification. We’re proud to offer and meet several industry-recognized testing and qualification standards, including AISC Certified Quality Assurance Program, AWS D1.1, D1.2, D1.3 and D1.5 code qualifications, API 1104, ASME Section IX Code Qualified, TIA 222 Rev. G, TIA 1019, NDT Level 2 in PT and MT, and Certified Welding Inspectors on staff. We streamline the finished fabrication and delivery process by partnering with customers to meet their specific assembled, semi-assembled or kitted and assembled product needs. Our own managed vehicle fleet is equipped to assure safe, on-time delivery within a 250-mile radius of our facilities. We can coordinate delivery and logistics of finished components and fabrications directly to the job site through third-party partners ranging from LTL carriers to flat-bed semis. Confirmation from Precision that the job was done to customer drawings and specifications comes from material test reports, surface protection reports, welding process certifications, photos of welded products and other customer-specific requirements. Where required, customers receive a job book that may include material test reports, records of hydrotesting, weld mapping and x-ray inspection of all welds and other customer-specific requirements. Customer drawings are broken down into easy-to-follow instructions and requirements for our fabricators. Within a 250-mile radius of our Sistersville, West Virginia facilities, our trained and experienced workforce is able to provide the highest levels of customer satisfaction by delivering on-time, within budget and to agreed specifications.